With the cost of energy prices increasing using energy efficiently has never been more important. Household energy bills are increasing year on year. 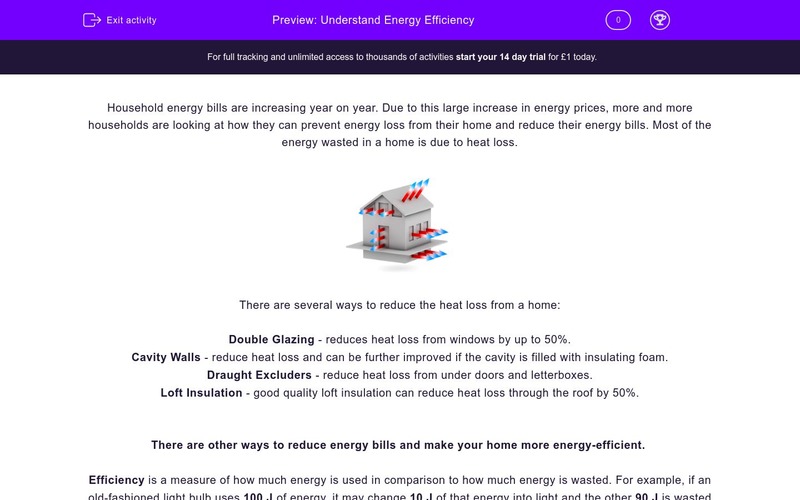 Due to this large increase in energy prices, more and more households are looking at how they can prevent energy loss from their home and reduce their energy bills. Most of the energy wasted in a home is due to heat loss. Draught Excluders - reduce heat loss from under doors and letterboxes. Loft Insulation - good quality loft insulation can reduce heat loss through the roof by 50%. There are other ways to reduce energy bills and make your home more energy efficient. Efficiency is a measure of how much energy is used in comparison to how much energy is wasted. For example if a standard light bulb uses 100 J of energy, it may change 10 J of that energy into light and the other 90 J is wasted as heat energy. The light bulb is only 10% efficient, as 90% of its energy is wasted as heat. Low energy light bulbs are 40% efficient and therefore reduce your energy bills by wasting less energy. What form of energy is lost from the home in the greatest quantity? Which of the following reduces heat loss from the home? Which THREE of the following can be used to prevent heat loss from the home? Televisions convert electrical energy into three different forms of energy: light, sound and heat. Which of these three types of energy is wasted energy? Electrical appliances have an energy label on them (like the one shown below) so that consumers can see how energy efficient the product is before they buy it. 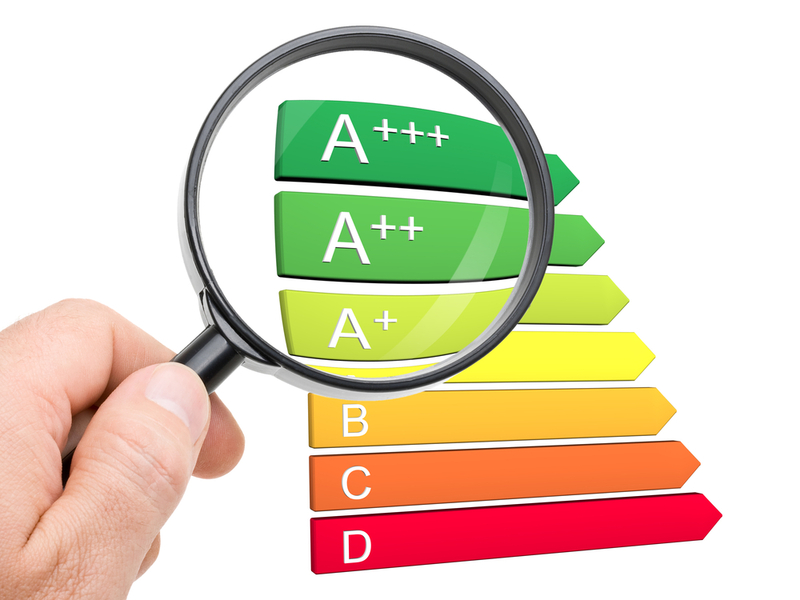 Which TWO of the following should you do to ensure that all electrical appliances are as energy efficient as possible? Which of the following is the correct formula used to calculate efficiency? 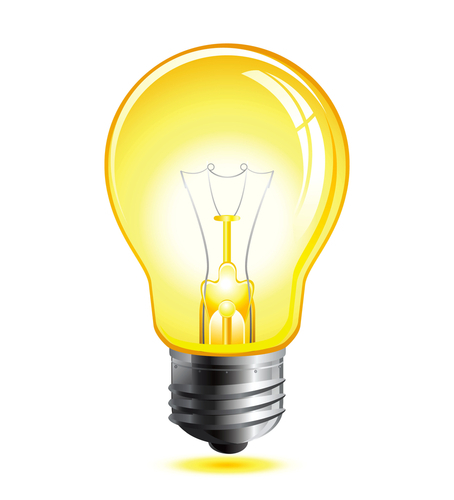 A standard light bulb uses 50 J of energy every second. 30 J of this energy is wasted as heat. What is the efficiency of this light bulb? An electric drill uses 600 J of energy every second. If 200 J of this energy is wasted in sound and heat how efficient is the drill? 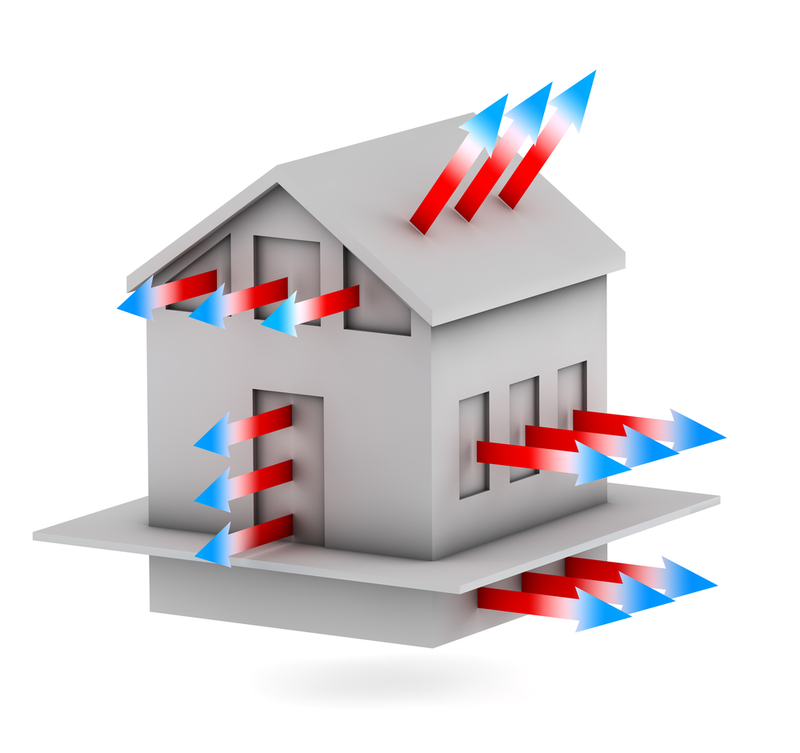 Thermal (heat) energy is lost through the home in many ways. Loft insulation can reduce heat loss through the roof by up to 50%. 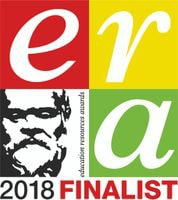 Double glazing, loft insulation and draft excluders are just three of the ways you can prevent heat loss from the home. Have you considered how you could make your home more energy efficient? Televisions transfer the electrical energy into light energy for the screen and sound energy so that we can hear the television. The heat energy produced is wasted energy. Electrical appliances still use energy when in standby mode and should be switched off at the wall. Kettles use lots of energy, so only boil the correct volume of water and avoid refilling it each time. Efficiency is equal to useful energy ÷ total energy x 100. Nothing is 100% efficient at converting energy.